Closed due to arson. The bar car has since been torn down. 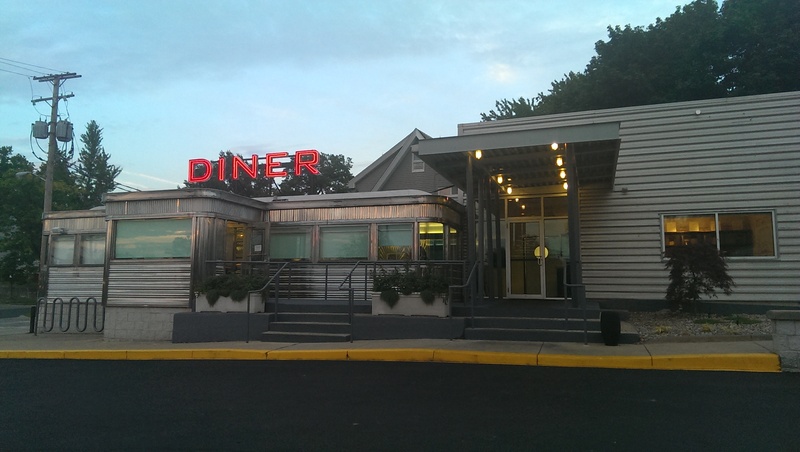 Doug Katz of Fire, Food and Drink and Provenance’s latest venture is a diner car – and not just any diner car, but the diner cars on Lee Road that have hosted several restaurants since I moved to Cleveland Heights a few year ago. I wanted to wait to write about my visits to give them time to settle and to enjoy a collection of their dishes. The restaurant is located in the diner car to the left, while the diner car on the right features a 1920s-style speakeasy bar that guests have to dial in to access. I haven’t made it to the speakeasy yet, but was honored to be given a tour by Doug before the place opened when dining with friends at a place down the street. The seats in both cars are luxurious, and you sink into them easily. Perfect for a relaxing meal or drink. Parking in the small lot can be tight, but luckily there is an abandoned Rite Aid across the street – as well as on-street parking. When you walk in you are greeted by a pastry counter and espresso machine. The pastries are all homemade. 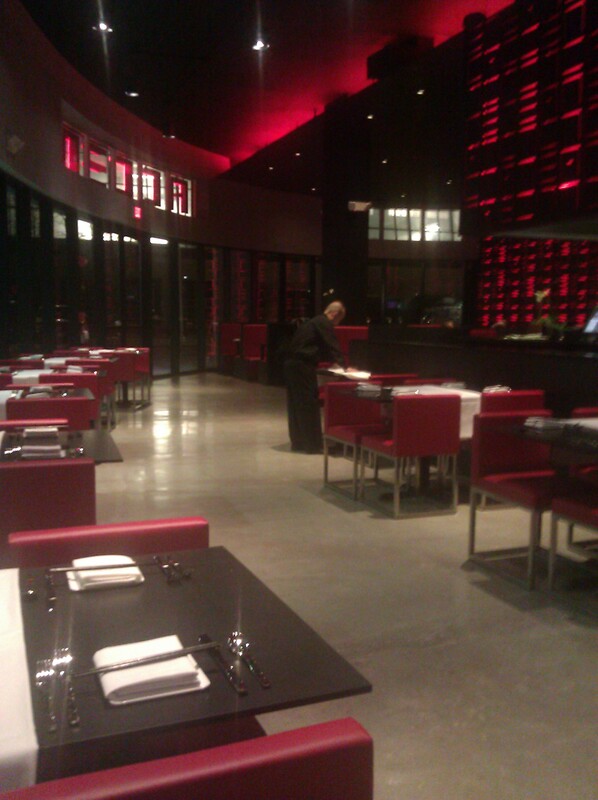 The surroundings inside the renovated dining room are warm and comfortable. Doug has installed polished steel, dark woods, gray vinyl and white tabletops. The polished steel is eye-catching and industrial. The tables feature starched and neatly folded white dishtowel napkins with a black border. Update: They have changed the menu. The only things remaining that I talk about here are the coffee, the French toast, the adult milkshakes, the Katz Club, and the Eggplant Reuben. They may bring some of these back as specials. For example, the Matzoh Ball soup was a special during Passover. I talk about some of the newer items at the bottom. 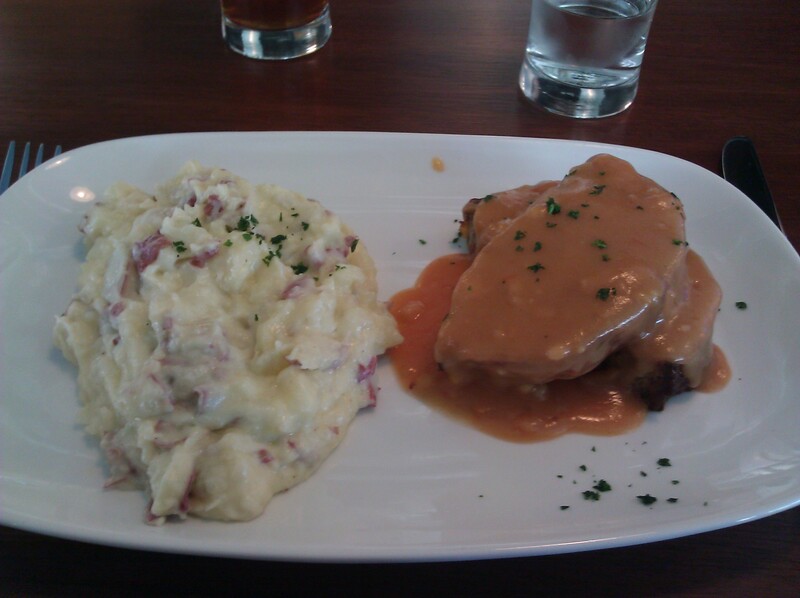 My first visit I ordered the meatloaf and garlic mashed potatoes. I was a little leery of the tomato cream, but one bite had me wishing I had a big bowl of it. The sauce is luscious. The only thing I miss from the dish is a side of steamed broccoli to balance out the carbs and the protein, but I think that stems from my childhood when meatloaf always came with broccoli. My dining companion enjoyed her Reuben and gave me a bite. It was delicious, and everything she was expecting. Their breakfasts are filling. 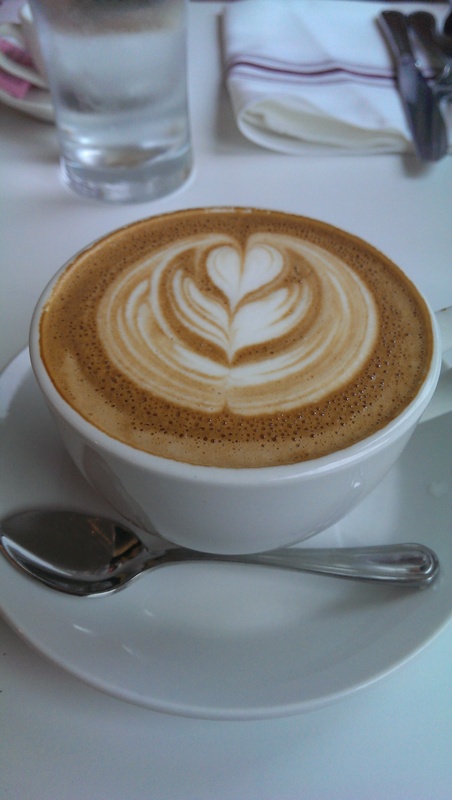 The coffee by Rising Star is divine – and comes served with barista art, which made me smile. If you want an espresso or cappuccino you won’t go wrong ordering one here. 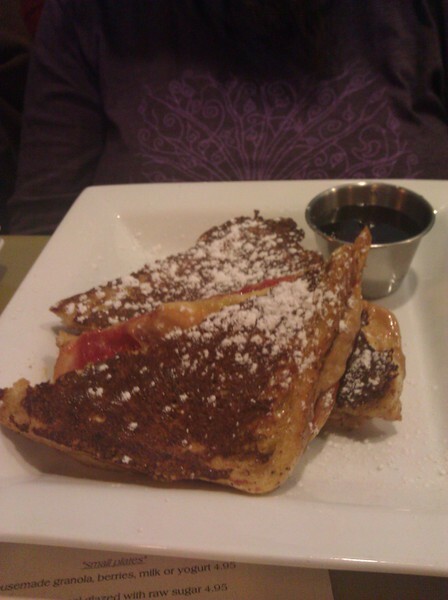 I enjoyed my French toast, which came with a side of beery compote, immensely. My companion enjoyed his eggs and bacon, while another companion thoroughly enjoyed his cheesy mushroom omelet. The Matzoh ball soup is to die for – served with chunks of chicken and veggies. Corky & Lenny’s and Jack’s Deli’s matzoh ball soup is just broth and Matzoh ball (although I think C&L has a couple carrots floating in it). 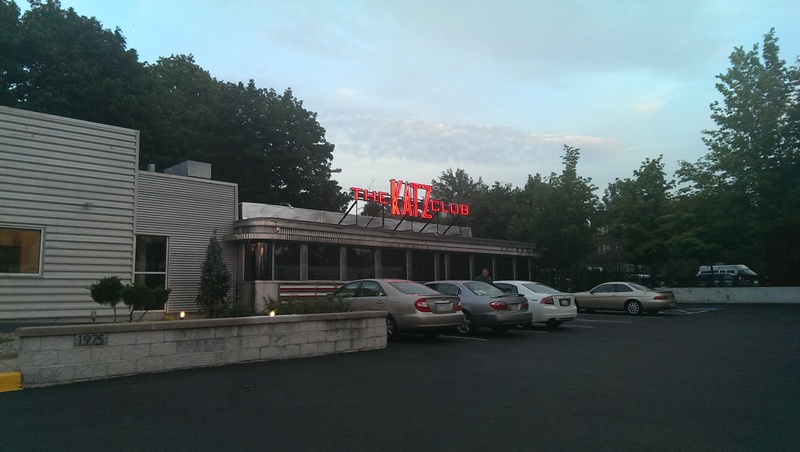 I paired it with a Katz Club, which includes a fried egg instead of ham – an intr iguing twist on the club sandwich. It was delicious, but I think the cold meatloaf sandwich is an even better pairing with the soup. Just because I love the meatloaf here (although I would have liked just a couple lettuce leaves scattered on the sandwich and not a hunk cut off the head and piled on top in the middle – some rearranging was needed before I could enjoy it). I enjoyed the pan-fried chicken and spaghetti-mushroom casserole on my latest visit. The farmer’s cheese didn’t melt real well on the casserole, but I think that is more due to the consistency of the cheese rather than the cooking of said dish (because I had the same problem with the tuna melt – see photo). This ain’t Velveeta – and thank goodness it isn’t! Again, I missed some veggies, so I ordered a side salad, which rocked my world with the addition of a warm bacon dressing. If you order nothing else here, you must try the warm bacon dressing! OMG! I have heard grumblings that the burger is disappointing, but with the meatloaf and cold meatloaf sandwich on the menu why would anyone try to order a burger here? I also heard a complaint about the tuna melt, which is served on an English muffin. This is how I learned to enjoy tuna melts – at The Millsville Diner in Twinsburg (RIP), so I was perfectly happy with my tuna melt. There are apparently two schools of thought on what makes a tuna melt – one being a grilled cheese-like melt. Who knew? Paired with a boozy chocolate shake (The Gene Wilder Shake, which features rum) I was a happy camper. Reviews have been mixed on Yelp. People either love it or hate it. I, for one, love it. Don’t go here expecting quickly-fixed, inexpensive, greasy-spoon-diner food. In fact, the food here is relatively expensive, though portion sizes are generous and ingredients are high quality. Most everything is locally sourced, and the attention to quality shows. I don’t know if it is a coincidence, but it seems like almost every time I’ve been here Doug has been here as well. I think it is a testament to his passion for the food and desire to make this restaurant a success. It’s definitely worth a trip. Update: I met friends here for lunch and we shared some of the new items. I ordered the Creamy Smoked Chicken soup and didn’t share it. It was that good. It features spaetzel, great northern beans, kale, fine herbs & focaccia croutons. It was zesty and smoky and just a lovely soup. I ordered the tried and true eggplant Reuben, while my friend D. ordered the Masala Fish. It is a flavorful wrap that features house made naan, mint slaw & Indian Masala sauce. This fish wrap was amazing! Be sure to give it a try. Our other friend K. ordered the burger, and it was quite lovely. I don’t know what people were complaining about. It was moist and delicious. 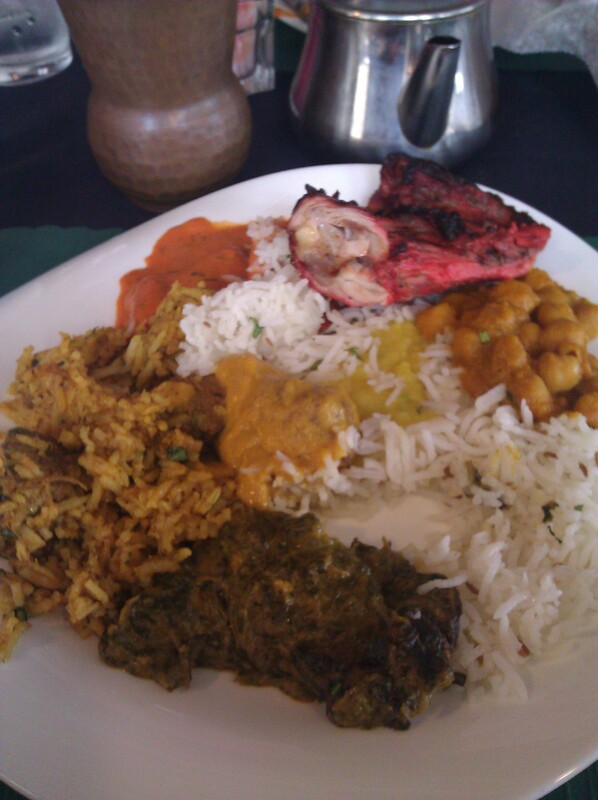 I was recently on an Indian kick and met a friend downtown for lunch at the buffet at Charkha. Charkha is located on W. 9th in the space formerly housing the Waterstreet Grill. It is a family owned and operated business that recently opened in May 2012. 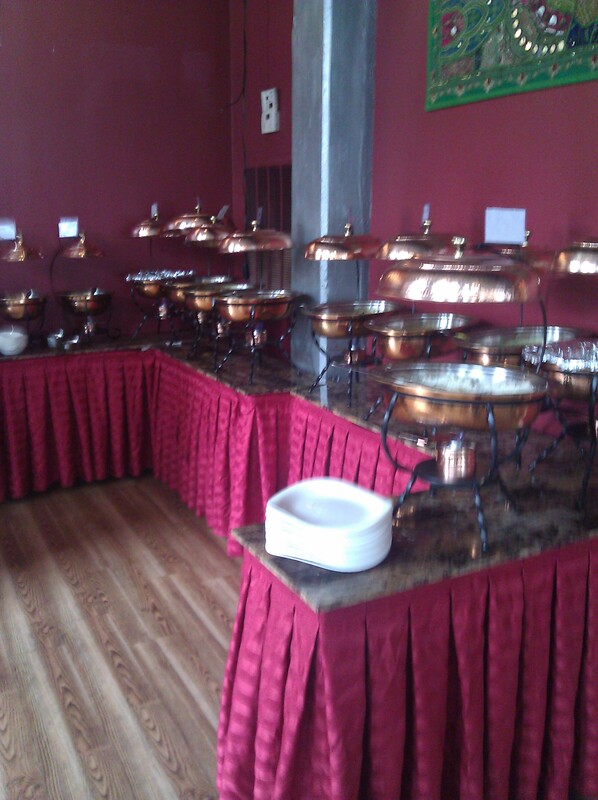 My best friend, who is Indian, highly recommended the lunch buffet as a good value with good food. The lunch buffet is offered from 11:30 to 2:30 Monday through Saturday. They offer a wide variety of selections, including both vegetarian and non-vegetarian dishes, with more than 8 different main courses, a salad bar, appetizers and desserts for only $9.95. The selection changes daily. Getting there was a little frustrating due to the city repaving W. 9th. Not only was the street torn up, but there was no on-street parking available. My friend and I parked in the Bingham’s paid lot across the street and played Frogger with the lunchtime traffic while crossing the street. One friend ended up not joining us because she was so frustrated with the lack of parking (she had to go somewhere else downtown after lunch and would have to pay for parking a second time, which she wasn’t willing to do). The buffet came with naan, which was warm and slightly charred from being freshly fired. I love the char taste and could have kept eating the naan. The day we went they featured tandoori chicken, saag paneer, a curry dish, some lentil and chickpea dishes, and goat biryani. I had never tried goat before, but I’m willing to try anything once (as long as it isn’t an organ or the thought of it doesn’t gross me out – like chicken feet). It wasn’t bad. It tasted a bit like gamey beef and paired well with the spiced rice. One of my main complaints about Indian buffets is that the rice is often dried out. It wasn’t the case here. The rice was light and fluffy even though we arrived there at the tail end of the lunch rush. 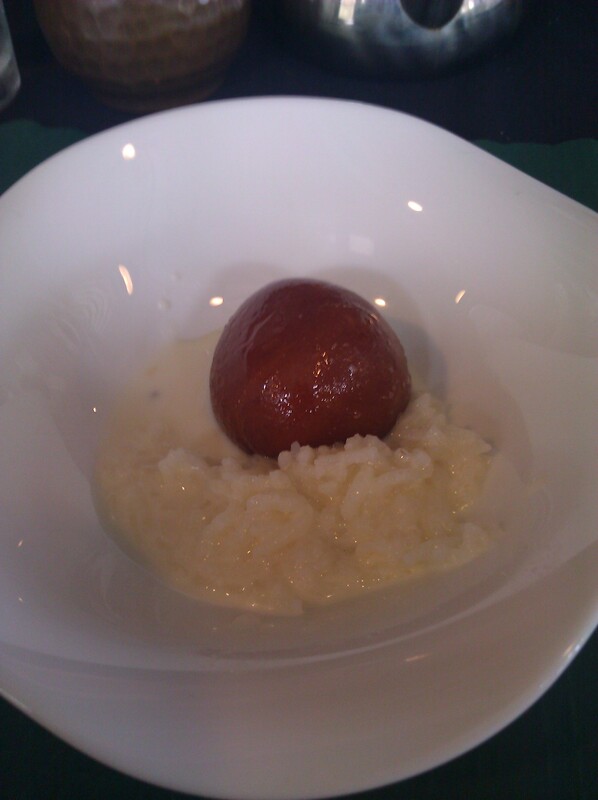 The desserts included Kheer (Basmati rice cooked in sweetened milk) and what I think was Gulab Jamun (a tiny, sweet doughnut hole-like pastry in a sugar syrup). The buffet is all you can eat, but we only managed one full plate, a second trip to just get one or two more things and then a small dessert. I still felt I easily got my money’s worth. I ordered my usual mango juice and chai. 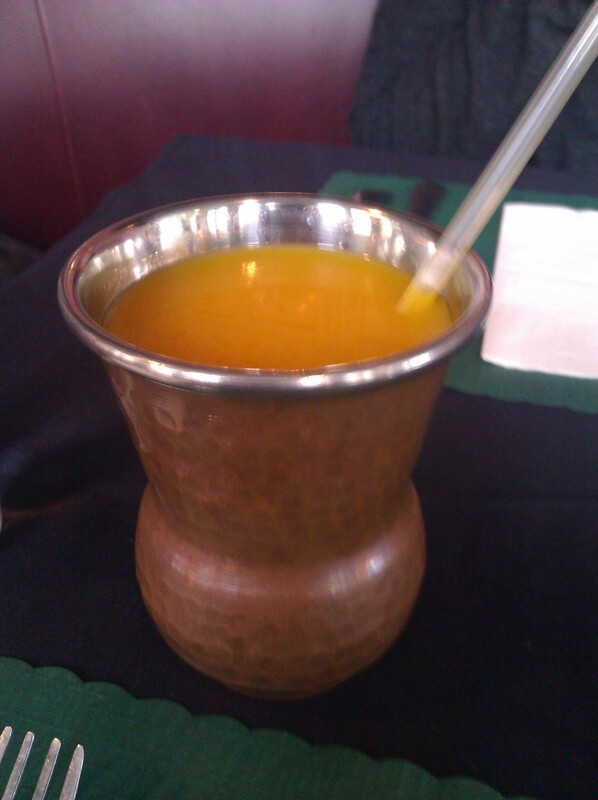 The mango juice is served in a copper cup, which kept it cold. The chai was once again pretty bland. I’m starting to wonder if it’s me or if my best friend’s mother simply has ruined me for any other chai. I found Charkha to be a lovely space with good food and an excellently priced lunch buffet. I look forward to eating there again soon. 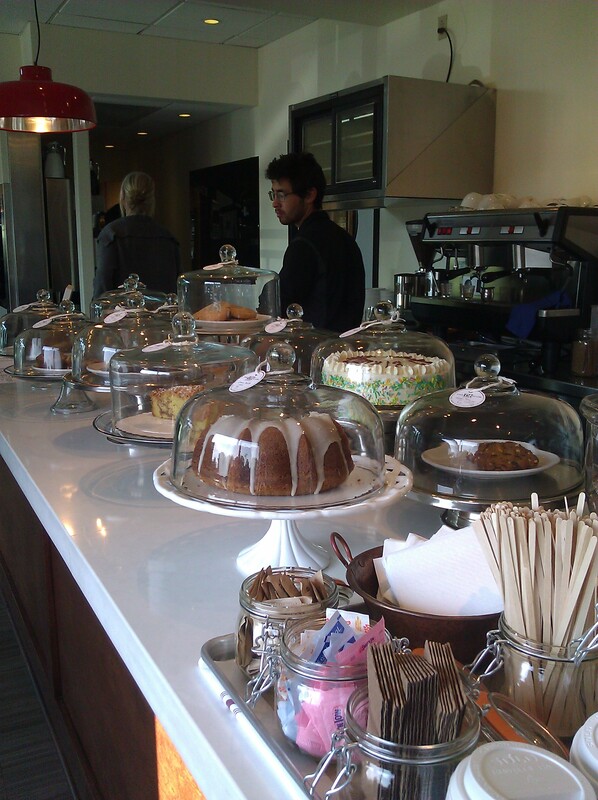 Accent recently opened on Euclid Avenue, just before the entrance to Lakeview Cemetery. It is owned by SASA’s Scott Kim, and as soon as I read about the Robata Grill and Josper Oven, which flash-cook meats and vegetables leaving them perfectly cooked yet flavorful and deliciously moist, I was intrigued and knew I needed to check it out as soon as possible. Like Crystal at East*Drink*Cleveland, I usually avoid new restaurants to allow them to find their groove and work out the kinks, but I simply couldn’t wait this time. The fact that it is so close to my home was definitely a deciding factor. You can see the warm and inviting red glow from the street. The egg-shaped dining room is modern yet inviting. Word of warning: I had trouble finding the front door. It is closer to the Uptown plaza center than the valet stand. It had been a pan-Asian week for me that week, having enjoyed a banh mi and pho at Saigon Grille for lunch and the SASA happy hour for a late dinner on Monday, dim sum at Emperor’s Palace on Wednesday and then Accent on Thursday. I ordered a hot green tea to warm myself up along with a Rosemary Lemon Drop to start and followed it up with an Uptown Cosmo. The Rosemary Lemon Drop was good, but I preferred the Uptown Cosmo. The Lemon Drop was a little sweeter than I expected, having honey vodka in it. The Cosmo was more my style, even though I normally don’t order Cosmos. 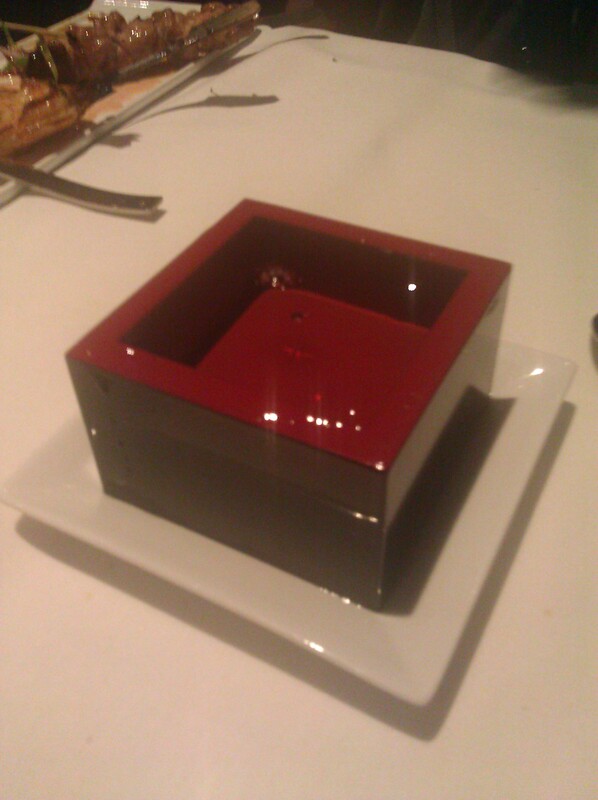 My friend E. ordered the overflow sake, which was served in a bento box on a saucer to catch the “overflow”. It was a unique and whimsical menu addition. Chef Michael Lyon recognized E. (who had already been there 3 times, but this was the first time since it had opened), and sent out some complementary kim chee as a welcome. Normally I’m not a fan of kim chee (I worked at a Korean printing company for a bit in Germany where there were several batches marinating every day, I would come home smelling of kim chee), but this kim chee was delicious. Kim chee is a traditional fermented Korean dish made of vegetables with a variety of seasoning. It is traditionally a quite spicy pickled cabbage and other vegetables like daikon, all brined in salt, flavored with herbs, garlic, ginger, and often liberal amounts of red chili peppers. 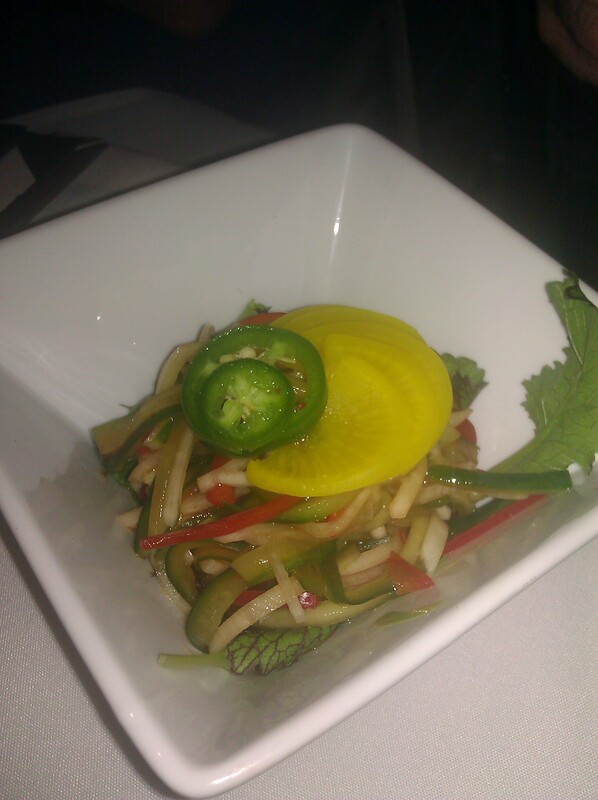 The pickled vegetables in Accent’s kim chee were light and fresh and not as spicy as some I have tried. I enjoyed it, which surprised me. We of course had to order an order of the addictive SASA fries. 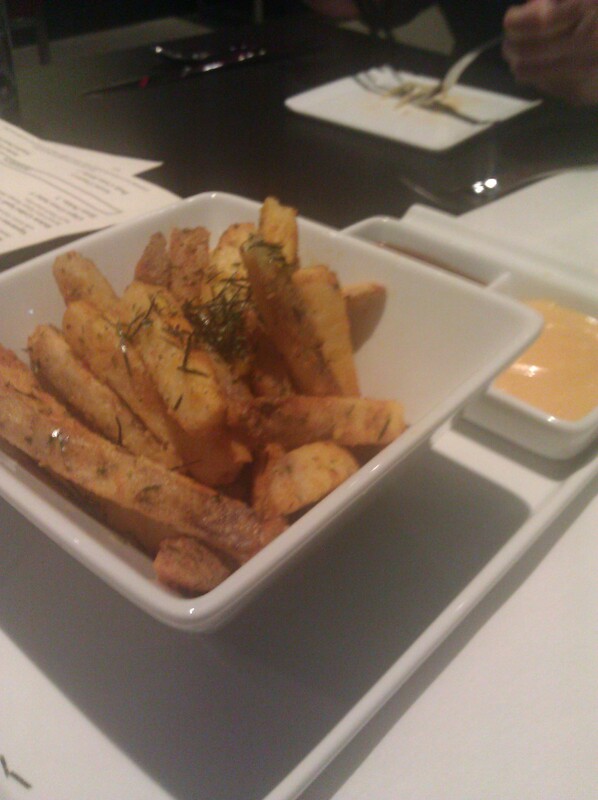 The fries did not disappoint, being nice and crisp yet soft inside with a nice flavoring from the seasoning and rosemary. My favorite sauce is the orange dipping sauce. I always manage to finish it off before the fries are gone. Yum! We asked to order off the lounge menu, because we wanted to try the small plate grilled items from the Robata Grill. Luckily our server was very amenable. I cobbled together a delightful meal from the various small plates. I started off with the Pork Broth with Vegetables, Beef and Brown Rice and a side of Shrimp Yakitori skewer. The menu said you could add any Robata item for $2, but I think the server misunderstood and charged me full price. I wasn’t going to quibble over $4, so I didn’t bother mentioning it. It certainly didn’t detract from my experience. In any event, I LOVED the ramen. 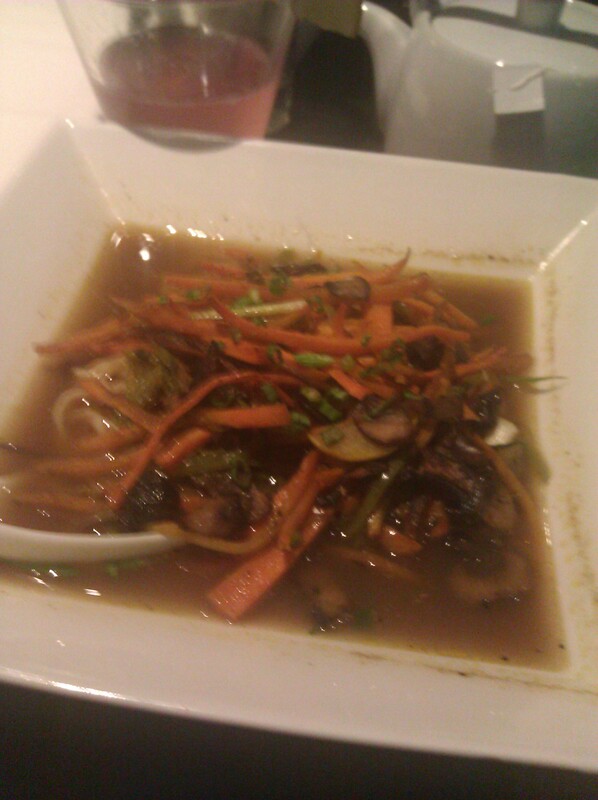 The broth was extremely flavorful, and the vegetables were deliciously fresh. I felt very healthy for having ordered it. 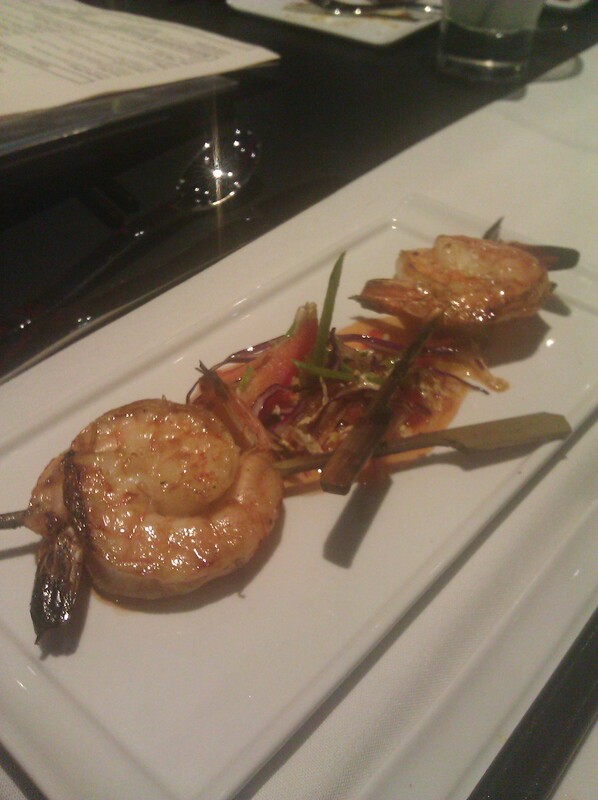 The shrimp yakitori was perfectly grilled, and the four shrimp on the skewers had a wonderful grilled taste to them. In fact, the heat from the grill had fused them together pretty well. 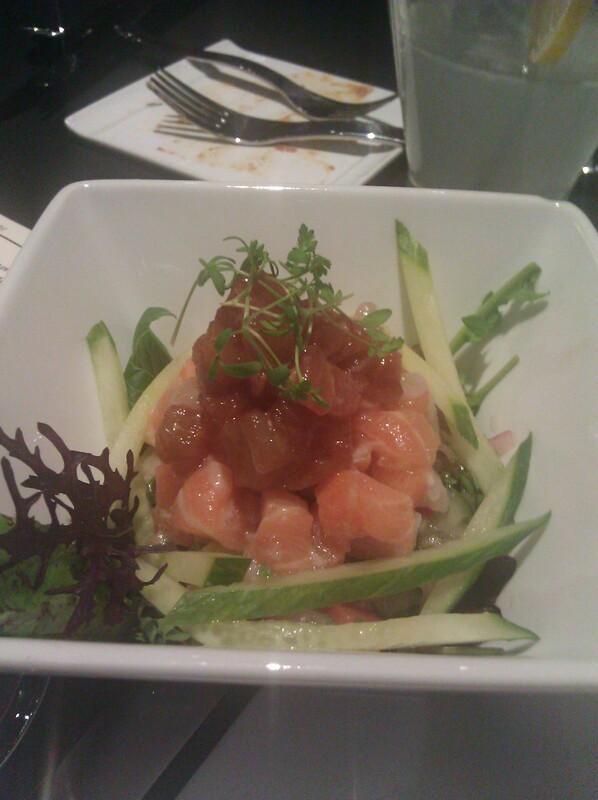 My friend B. ordered the Accent Crudo, which features tuna, hamachi, and salmon, off the dinner menu and let us try it. It is Accent’s version of ceviche, which is raw fish marinated (aka “cooked”) in lemon or lime juice. Crudo is the Italian version of sashimi: raw fish at the peak of freshness, dressed simply with olive oil and lemon. The fish was was very light, bright and fresh and not at all “fishy”. I will definitely be ordering this next time! I’m a sucker for a good ceviche, and this one did not disappoint! I also knew I had to order a turkey rib (not pictured, because my photo didn’t do it justice), having read about it on Crystal’s blog, and even if I hadn’t come in knowing I would order it my friend E. had also insisted we all order one. It was divine. The meat was tender and nice and smoky. Most importantly it was deliciously moist. The “rib” is actually the collarbone, and it definitely got me in the mood for Thanksgiving. 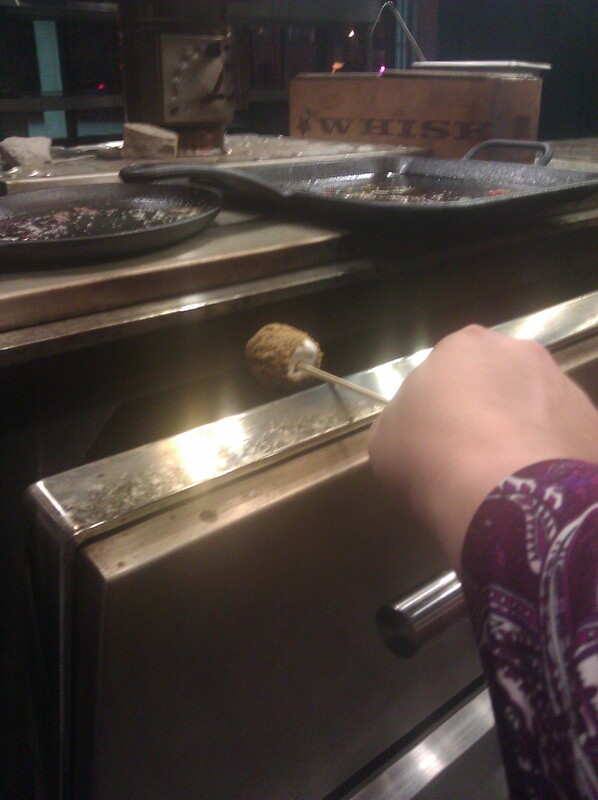 We knew we needed to finish our meal with the s’mores. The s’mores feature four marshmallows that have been skewered, rolled in chocolate ganache and graham cracker crumbs and then blasted in the Robata. Chef Lyon invited us back to the kitchen once the rush had died down, and we were able to roast our s’mores over the Josper Oven. It was extremely hot (obviously), so we were very careful not to accidentally burn ourselves and not to have the melted marshmallow fall off the skewer. 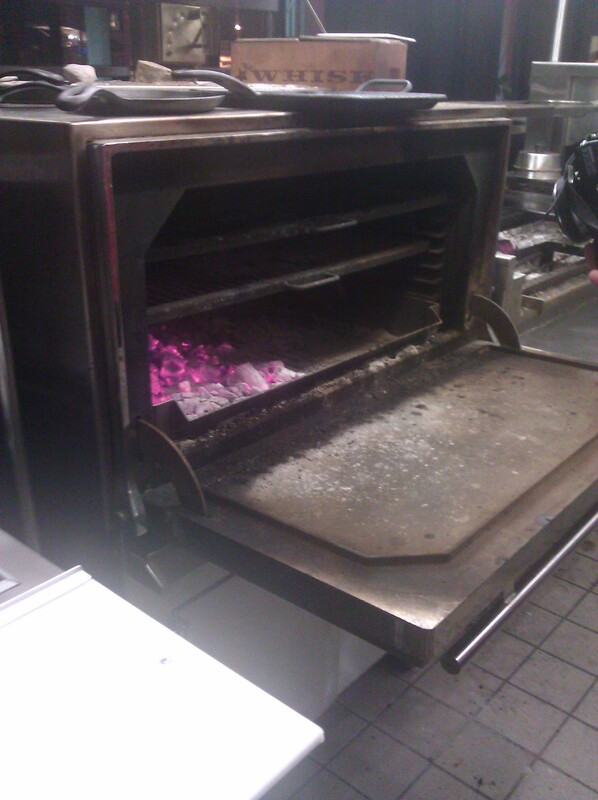 Chef Lyon explained that they leave the Josper Oven on all night, moving the coals from the Robata to the oven to keep them warm. The temperature in the oven falls to 300 degrees overnight, but quickly fires up again in the morning. He proudly showed off his kitchen, and we tried as best we could to stay out of the staff’s way. He talked about wanting to possibly add a raw bar, and we were able to give him some suggestions that might be fun to see implemented. I can’t wait to see what he does with the place and really hope it succeeds in this up-and-coming district. Now that MOCA is open, be sure to pop down the street afterwards and enjoy their happy hour or tapas, lunch or dinner menus. We left pleasantly sated – but not too full – and looking forward to our next visit. If anyone wants to meet me there for Happy Hour just say the word! 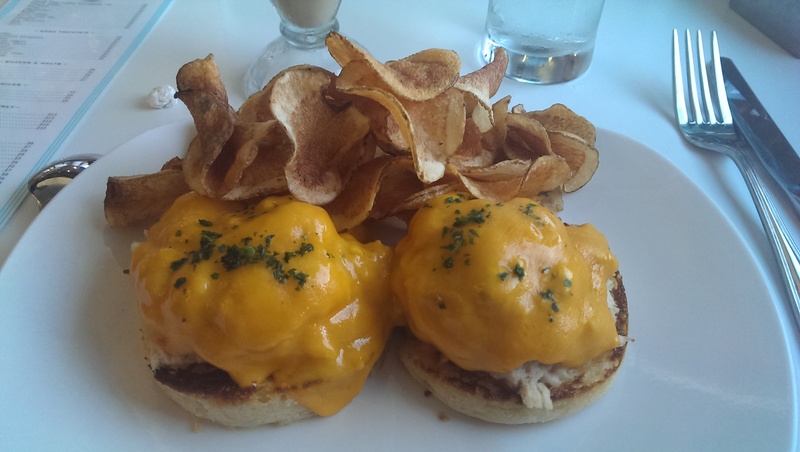 Carnegie Kitchen has a killer brunch. If you haven’t tried it yet you need to do so. 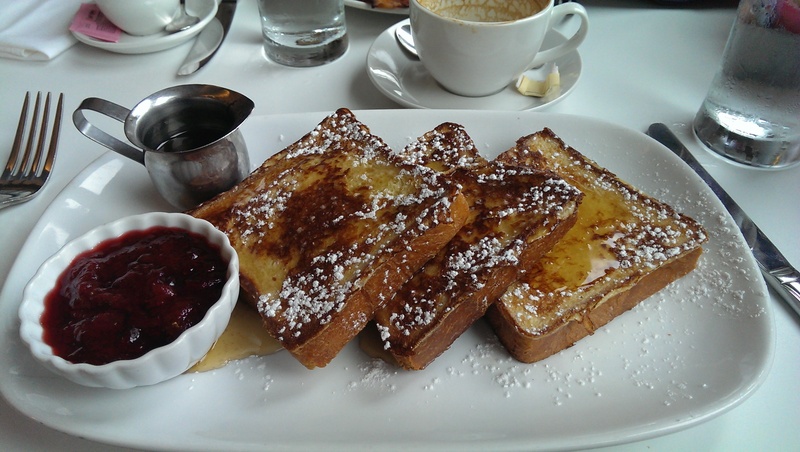 Their brunch offerings are definitely unique and delicious, and I can’t wait to go back and try the PBJ French toast for myself! 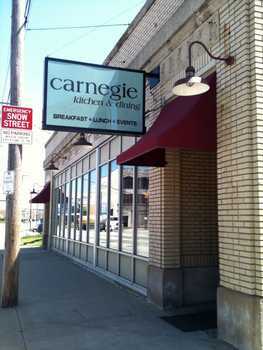 Carnegie Kitchen is conveniently located on Carnegie right off the E. 14th street entrance ramp. Since I live in Cleveland Heights, it was a straight shot down Carnegie, which made it even better. It is only open for breakfast, brunch and lunch, from 6 AM-3 PM on weekdays and 7 AM-3 PM on Saturday, but a lot of my favorite places in Cleveland also close after their lunch service, such as Inn on Coventry, Jim’s Diner in Solon, Claudette’s in Westlake, First Watch, Slyman’s, etc. There’s something indescribably unique about a restaurant that is only open for breakfast and lunch. Carnegie Kitchen has ample free parking in the parking lot next to the building. The building itself is not much to look at, being a big brick box, but lots of large windows allow for a lot of natural light to enter. Our brunch group met at 11 AM on a Saturday for brunch. They greeted us warmly, and we were shown to our reserved table. One of our diners had her two kids with her, and they were easily able to accommodate them. There were a few occupied tables already, but the place wasn’t packed. I honestly don’t know why not, because we thoroughly enjoyed our meals. Our first order of business was to order a round of mimosas, but unfortunately they were out of champagne that day. 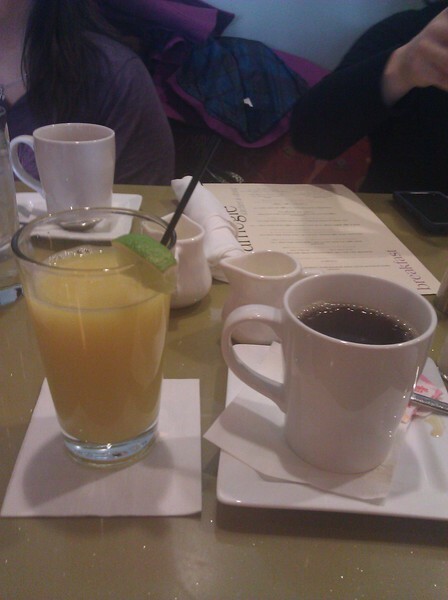 They had beer and wine, but I stuck with orange juice and coffee. My friend A. ordered a glass of white wine, which made me smile. Wine with brunch, why not? I ordered Eggs in a Nest, which features an old childhood favorite: “egg in a hole” made of French brioche toast accompanied by house-made pork sausage flavored with sage, rosemary and other herbs (you could definitely tell the sausage was freshly made, and it was divine!) and home fries made of Yukon potatoes. The traditional way for an egg in a hole is over easy or over medium, but I chose scrambled eggs that morning. I just wasn’t in the mood for a runny egg that day. 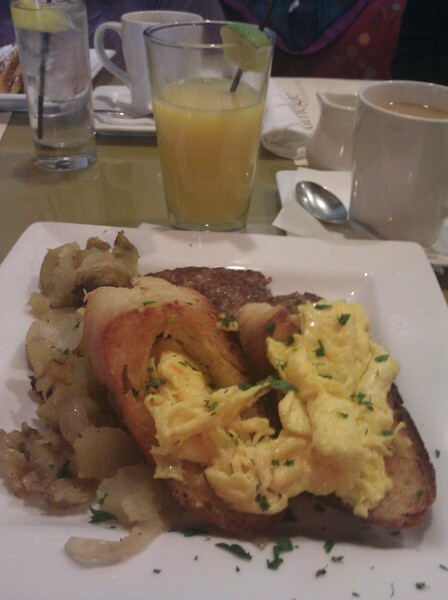 The scrambled eggs were artfully placed in the brioche, making it a thing of beauty, and I enjoyed it very much. 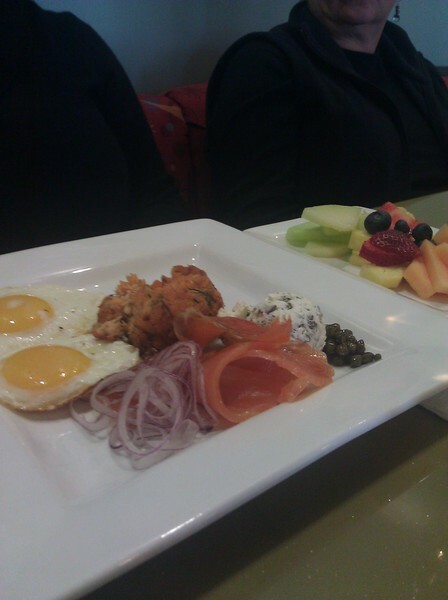 The salmon platter was also light and fresh, accompanied by two eggs, and was the perfect choice for someone on a no-carb diet when accompanied with a side of fruit instead of the bagel. We enjoyed a leisurely brunch and the frequent coffee refills, and then ventured out into the cold to enjoy the rest of the day. Driving home we stopped at Aladdin’s Baking Company on Carnegie for some fresh pita bread, olives, and probiotic yogurt. All in all, a wonderful way to start the day. 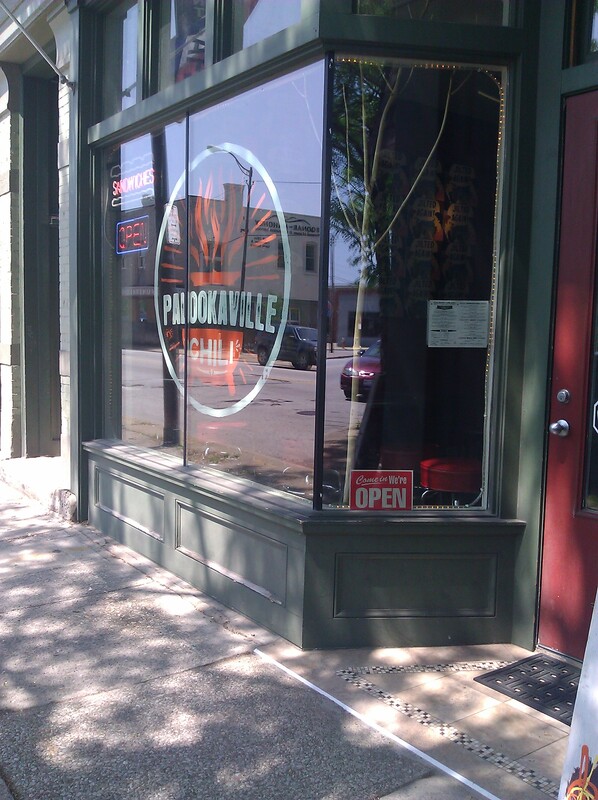 I met some friends for lunch yesterday at Palookaville Chili. Wow, we loved it. This funky chili shop on Lorain Avenue (just past Fulton) specializes in chili or (as they like to call them) “hot pots o’ soul.” If you like chili you’ll love this place. Once you see the bill you’ll love it even more. The star here is the chili, made from hand-chopped meats, fresh chiles, and proprietary spice blends. There are five “gourmet chilis” to choose from, including Texas beef, chicken verde, hot pork, spicy veggie, and spinach paneer. The spicy veggie and spinach paneer are vegetarian-friendly The chilis are served eight different ways – in a cup or bowl, on macaroni, on nachos, on rice, on a chili dog, in a burrito or as a sloppy jose. 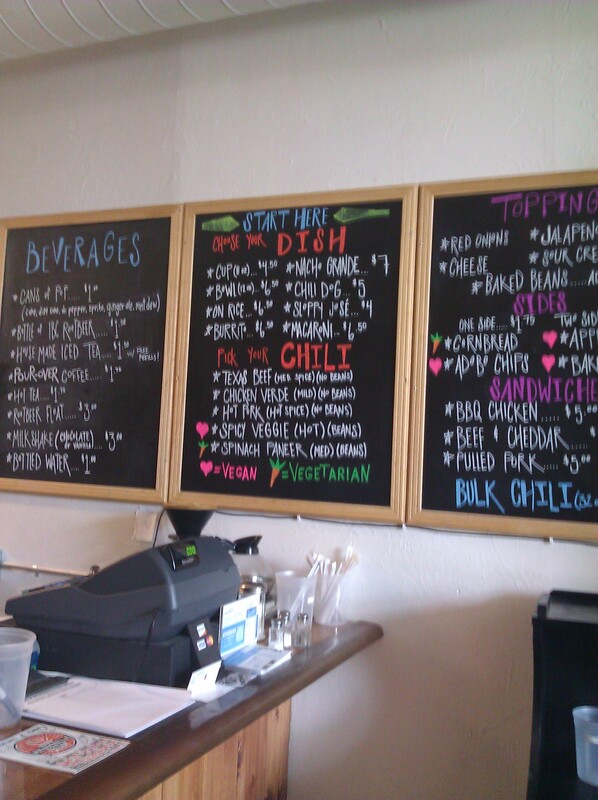 They also offer beef & cheddar, pulled pork and BBQ chicken sandwiches, which would pair nicely with a cup of chili. It is BYOB-friendly if you want to enjoy a beer with your chili. As soon as I saw it on the menu online I decided to try the Sloppy Jose. Being a fan of hoagie buns, this was right up my alley. 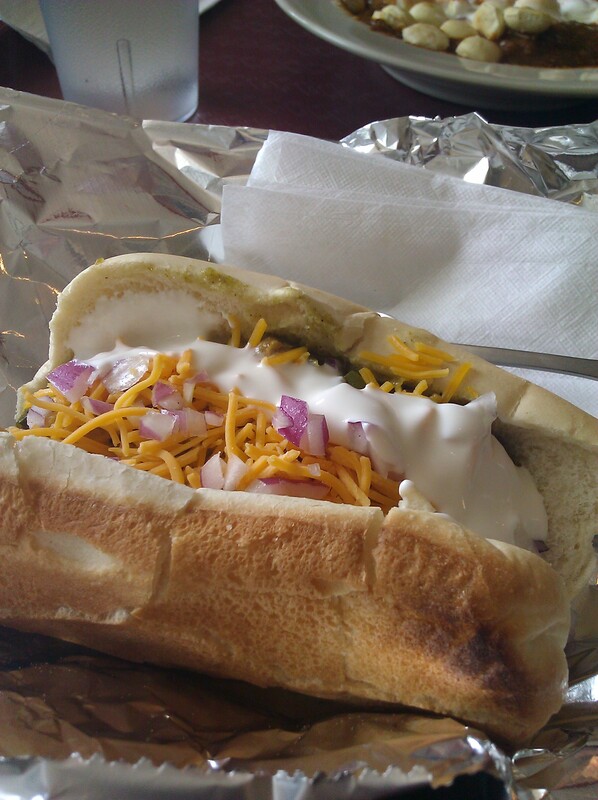 I could choose from any of the chilis and then could add toppings, including cheddar cheese, red onion, sour cream and jalapenos (baked beans are 50 cents more). I ordered the chicken verde (the mildest of the chilis) with everything but the jalapenos. I was going out to dinner that night and didn’t want to have heartburn or an upset stomach. It was served with a fork, which I quickly learned I would need. I tried to eat it as a sandwich and succeeded in making quite a mess. This sandwich was delicious. 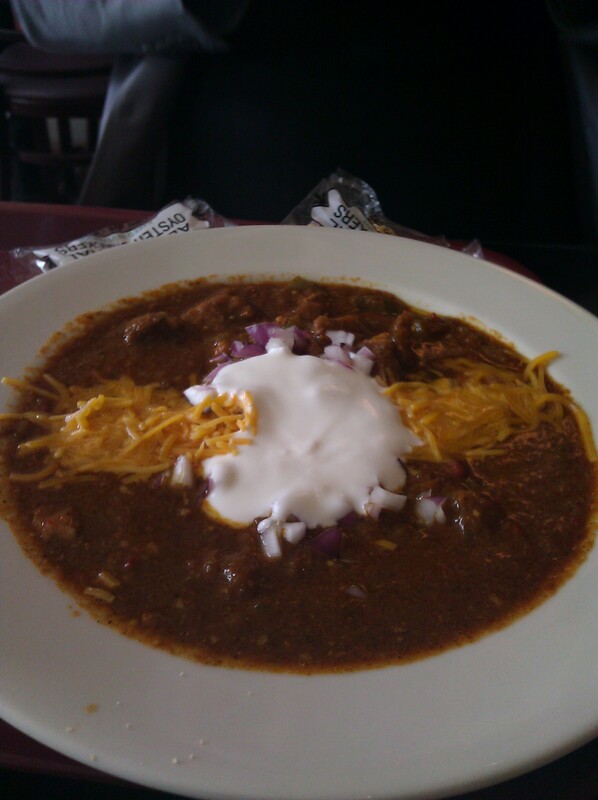 The chili was very flavorful and, for being a mild chili, had a nice heat to it. Combined with a can of Mountain Dew my bill came to a whopping $5. I also splurged on a side of cornbread, which was $1.75. It was worth every penny. 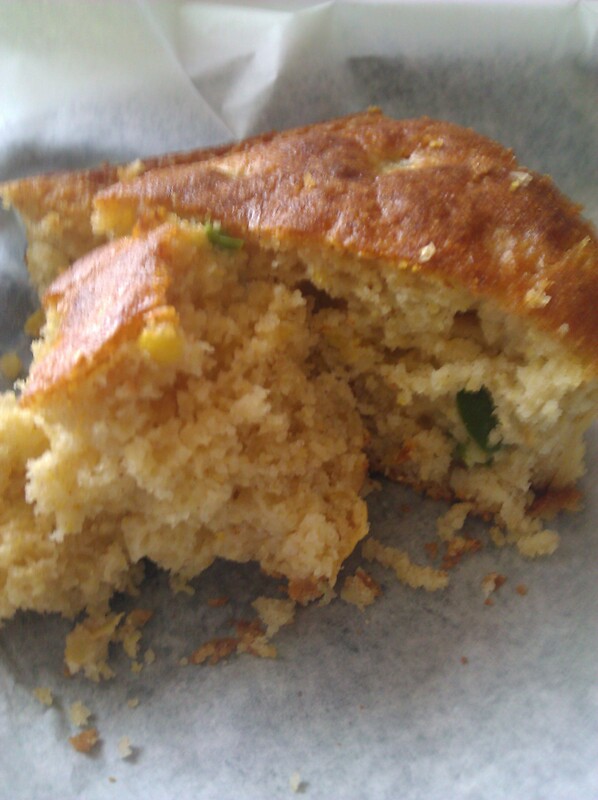 The cornbread was dotted with bits of corn and jalapeno and was more savory than sweet. It was also extremely moist. I also had the pleasure of trying my friend’s spinach paneer chili (not pictured here), which featured spinach, Indian spices, and cubes of fresh Indian cheese (paneer). Wow, that was good. Despite being a meat lover I can appreciate a good palak paneer, and this spinach paneer did not disappoint – with chunks of paneer in a spicy spinach-based chili. Yum! This little neighborhood gem is only open for lunch and closes at 4:00 every day. It features free wifi and plays some righteous bluegrass-rock music. My friend G. was loving the old-time music. We all felt very comfortable and will definitely be going back. Jezebel’s Bayou was an authentic New Orleans-inspired restaurant located in the old Menu 6/Boulevard Blue location on Larchmere. They fly their seafood in fresh from Louisiana every day. I love New Orleans, so I was very excited to hear about Jezebel’s, and the fact that it is so close to my home is an added bonus. If I could winter in New Orleans and spend the summers here in Cleveland I would do it in a heartbeat. New Orleans is a very unique city with a very unique culture – and outstanding food. I’ve enjoyed some amazing meals there. Our first visit to Jezebel’s Bayou started off rocky and just stayed rocky. I had made a reservation for 11 people for 1 PM several days beforehand, so it wasn’t like our big table was a surprise – or at least it shouldn’t have been. As I was driving to meet my friends on that rainy Saturday afternoon I got a call saying they were standing outside the restaurant and the door was locked (the hours on the door indicated they opened at 11, but maybe they hadn’t gotten around to changing the hours on the door). I called and was told that the chef had arrived late that morning from shopping and that they would be opening at 1 or 1:05. When I got there they were opening the doors and letting us in. They never seemed to hit their stride after that. To make a long story short, our lunch took 3 hours. 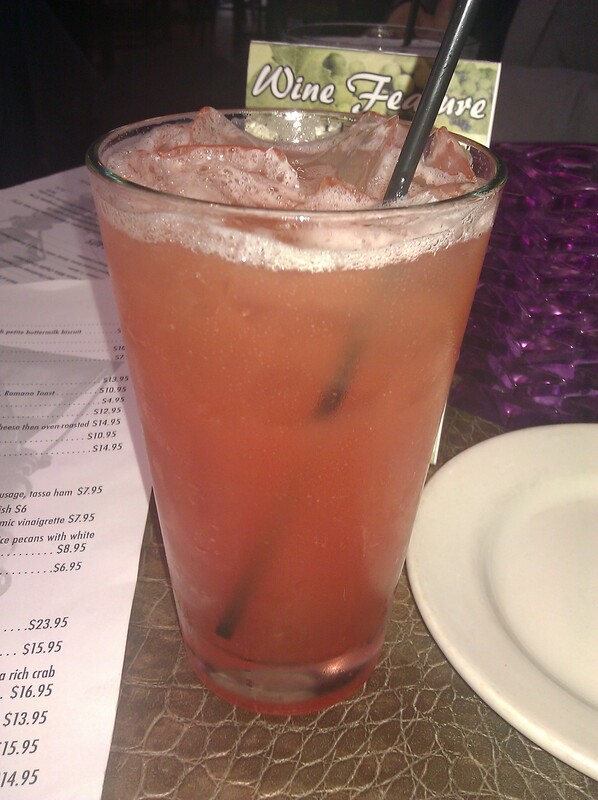 However, the drinks were potent, which made up for the long wait. It might have been the fact that we were “day drinking” on empty stomachs. Several of my friends got pretty crocked on Sazeracs while we waited, and I got pretty buzzed from my hurricane. I had to walk away from it at one point to visit the other end of the table, because I needed to slow down. My $9 hurricane was made with Myerʼs Dark Rum, Bacardi, 151, orange juice, pineapple and grenadine and was absolutely delicious. It wasn’t served in a hurricane glass, but that certainly didn’t detract from the drink itself. The food itself was really good. 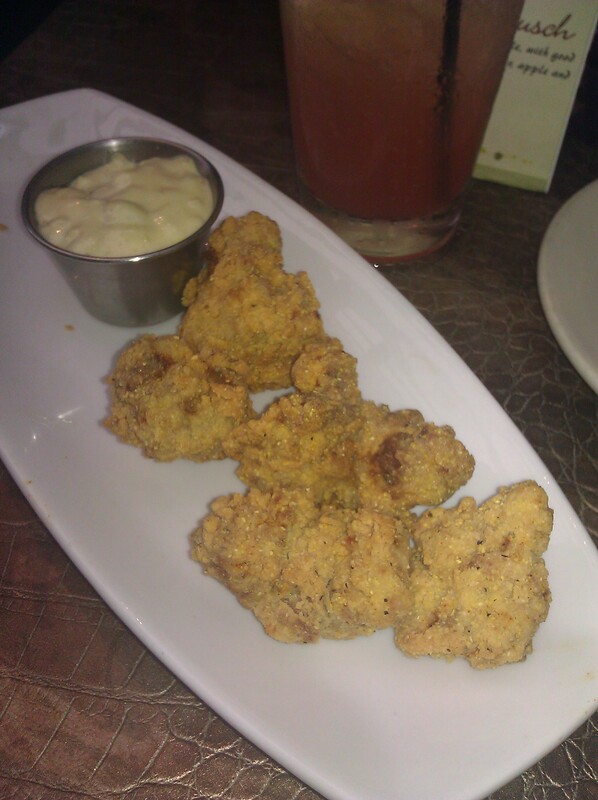 I started the meal by ordering the Alligator Voodoo, which are farm-raised alligator strips served with a Jalapeno Remoulade sauce. They were pretty moist, and the dipping sauce was very flavorful. I would definitely order this again. The New Orleans BBQ shrimp appetizer seemed a bit pricey for just four shrimp, although my friend A. said they were good. I’ll probably order them as an entree in the future. 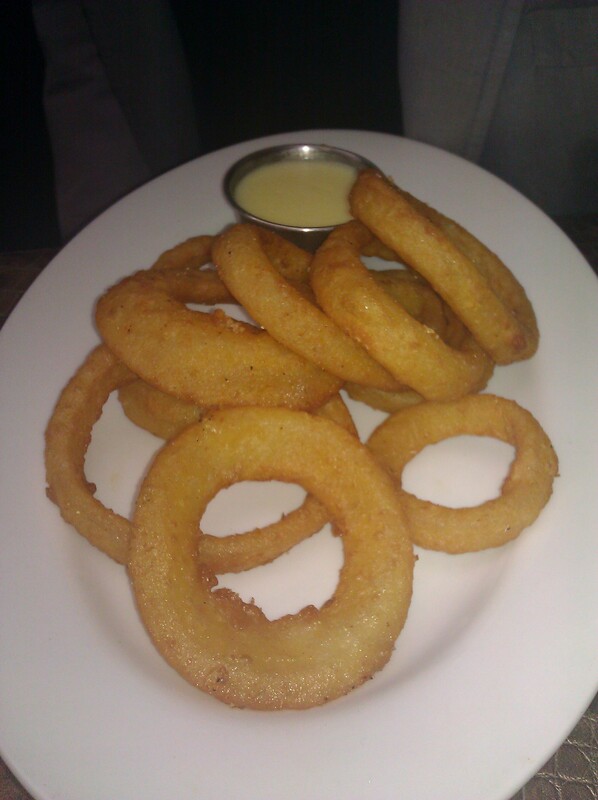 The onion rings, dipped in a Dortmunder Gold beer batter and served with a warm white Cheddar fondue sauce, on the other hand, were plentiful and delicious. I couldn’t stop eating them off my friend’s plate. That fondue sauce was divine!! My friend E. also thoroughly enjoyed his raw oysters on the half shell. I ordered the Shrimp and Crawfish Creole for my entree. Whooeee, was it spicy, which is just how Creole and Cajun food should be. I ordered it because it was served with steamed rice. I was glad it came with the rice, because the rice offset the heat a bit. 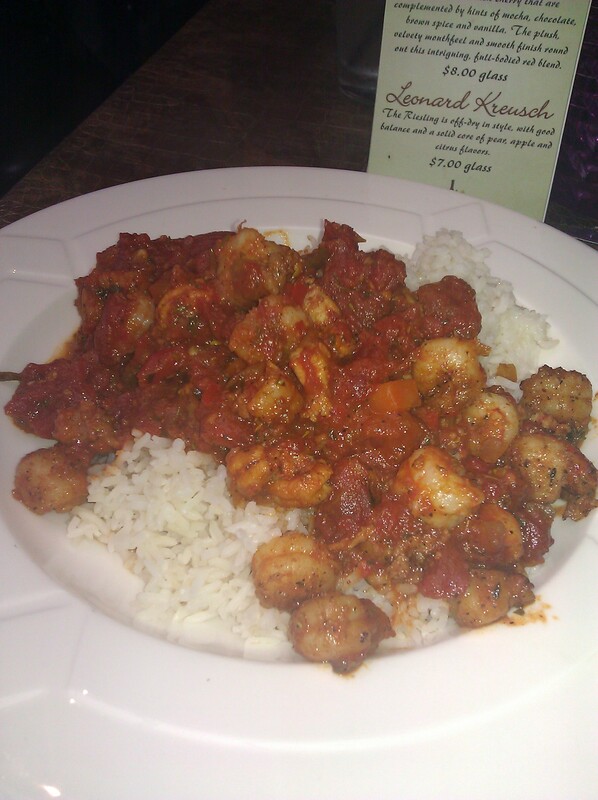 The shrimp and crawfish were perfectly cooked and the tomato-based creole sauce was very flavorful. I will also be ordering the Sweet and Crunchy Praline Salad in the near future. 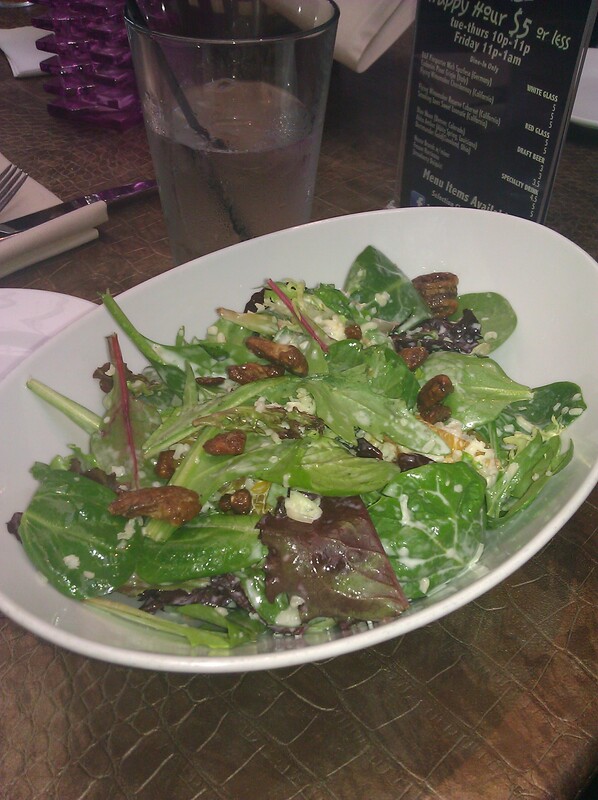 It is gorgeous and features mixed field greens, mandarin oranges, sun-dried cherries, white cheddar cheese, and sugar-spice pecans with a white French dressing. It was light and flavorful and the pecans were delicious. The owner came by at some point to welcome us and make sure everything was okay. He was so sincere we didn’t have the heart to complain about the unorganized service or slow kitchen. And we were enjoying ourselves, even if several of the folks had to be in Akron at some point. I wasn’t planning on going anywhere that afternoon and just enjoyed the company, so it wasn’t that big a deal to me. I just won’t be going back again with a large group. The smaller tables seemed to be taken care of just fine, having arrived after us and leaving before us. Several of my fellow diners were also surprised when they got their bill. It certainly wasn’t a cheap lunch, but it was a delicious and enjoyable one. I’m glad I have a New Orleans restaurant so close to home. I plan to give dining service one more try, and if it is just as slow I will simply stick to carry out in the future. As I’ve said in a previous post, I have been on a cooking class kick lately. The Chubby Cook has now gone the way of Viking Cooking. I’m on the search for good cooking classes, so please let me know if you here of any. I recently attended a pie-making class at The Chubby Cook presented by the proprietor of Humble Pie Baking Company (and my friend) Diane. Her pies are simply amazing. I have been buying her pies at local farmer’s markets and craft fairs. I am not a fan of pie crust. 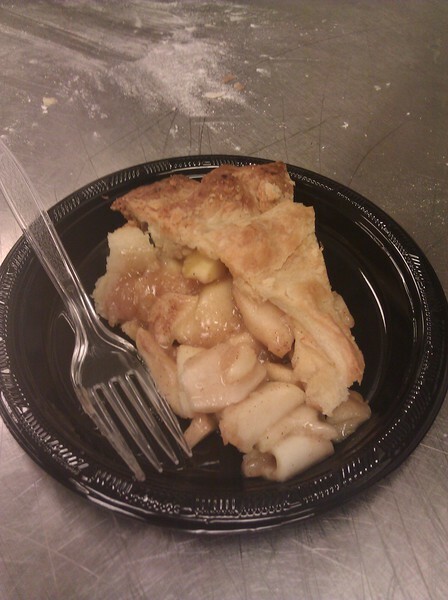 I worked as a waitress at Baker’s Square for five years, a nd I always threw out the crust after eating the pie innards. Not her pies! They are light, tender, flaky and crisp. I wanted to learn how to make her pie crust, so I jumped at the chance to sign up for the pie-making class. The Chubby Cook started out as a local food blog, but Scott branched out and opened his own carry-out restaurant/catering venue, which has now morphed into a catering venue and cooking school. It is located in the shopping strip across from Moxie’s (just down from Hiroshi’s Pub). The facilities were nicely arranged and very clean. I joined my two friends there and met some of the other attendees. We all had a ball. We were greeted by Diane and Scott and offered a glass of fresh cider from the orchard where Diane gets her apples. We put on our aprons and read through the recipe handout. 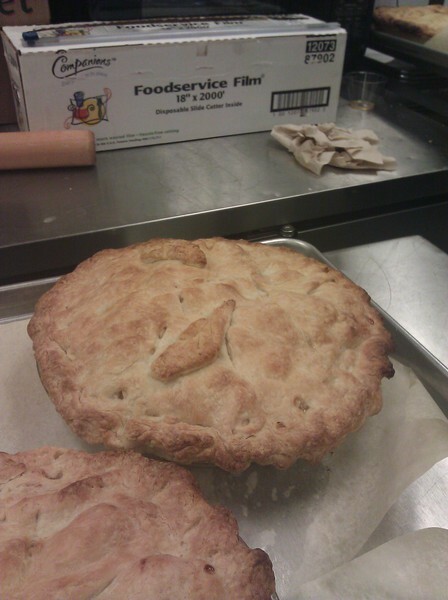 Diane started out by showing us how she makes a pie: cutting the butter and lard into the flour mixture, letting the dough rest, rolling out the dough, placing it in the pie pan, making the filling (lots of apples with cinnamon and butter!) and crimping and fluting the edges. I could have been happy just eating the filling by itself. While her pie was baking in the oven we were turned loose to make our own pie. 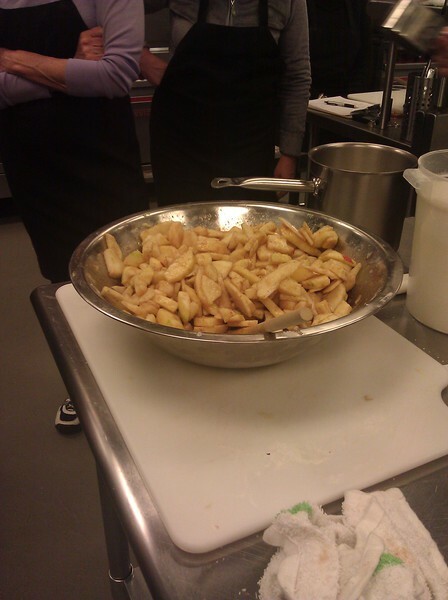 We followed the same steps Diane used, but we had to peel the apples first (she was peeling apples when we walked in). 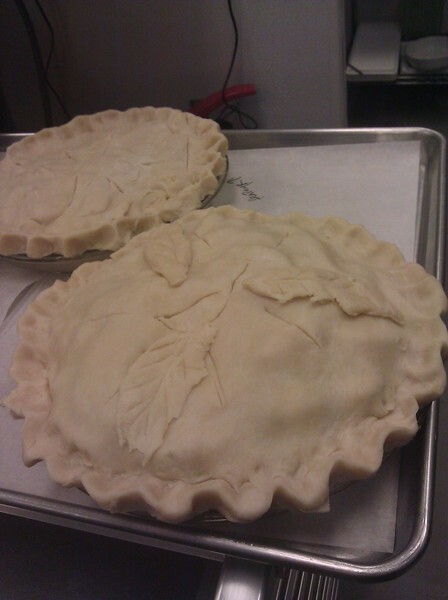 I got fancy and added leaves made from the extra crust dough to mine to differentiate my pie from the other pies. 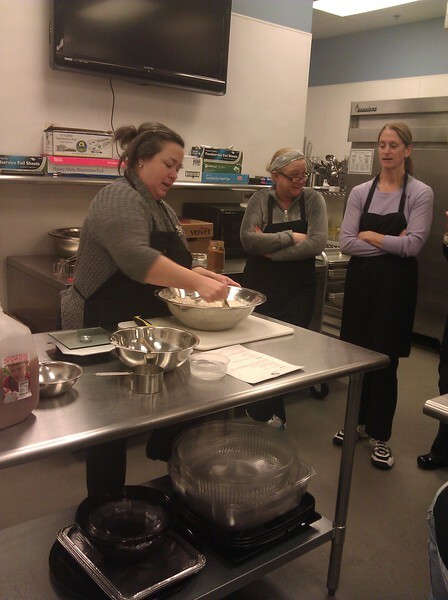 While our pies were in the oven, we dug into her pie and she showed us how to make crust in a food processor. She was an excellent instructor. Everyone’s pies turned out beautifully. Many attendees really appreciated all her tips like using half lard and half butter for the crust, where to purchase lard and all her tips on locally sourced produce. We all went home with our own steaming apple pie in a glass pie plate. Everyone who tried my pie that weekend absolutely raved about it. I went back a week or so later and picked up some pie crusts that she had dropped off for us. They are now in my freezer, and I can’t wait until the summer to bake and fill them! I walked out of The Chubby Cook covered in cinnamon and flour, but absolutely relaxed and ebullient. I can’t imagine a better way to spend a snowy morning than baking pies with friends. 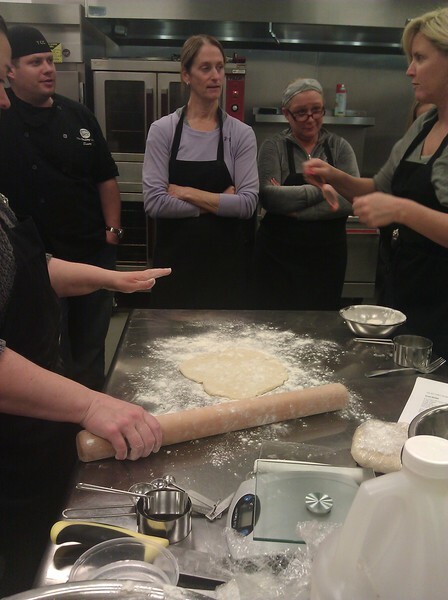 If you haven’t attended a cooking class, The Chubby Cook is a great place to start! Check out his class calendar today!